I have made a booking online when will someone contact me ? A member of our booking team will contact you by calling the number given on the booking form to arrange booking and payment. They will usually call within 2 hours, if however you have not heard anything within this time scale please call our office on 01843 295336 / 01227 788220. Can I cancel my booking even after my deposit is paid? Yes 250 miles per day, excess mileage charges at 0.09 pence per mile. What happens if I return a vehicle late ? If you return the vehicle later than the time specified on your booking you will be charged for the additional time that you have had possession of the vehicle. The charges incurred will be at the usual daily rental rate of that vehicle and will be taken from the deposit. If you are over 30 minutes late you will be charged for a full day. What should I do if I have a problem with a vehicle ? 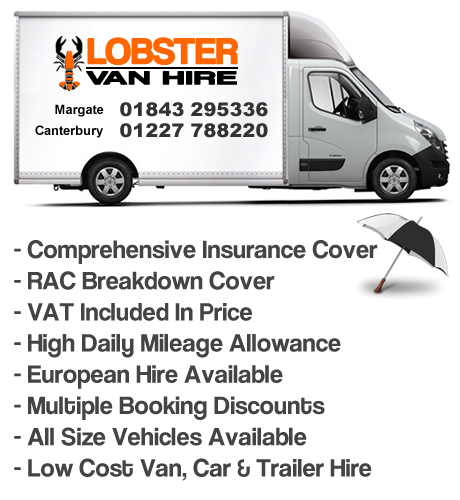 Contact Lobster Van Hire immediately on 01843 295336 / 01227 788220. What should I do if I have a complaint ? 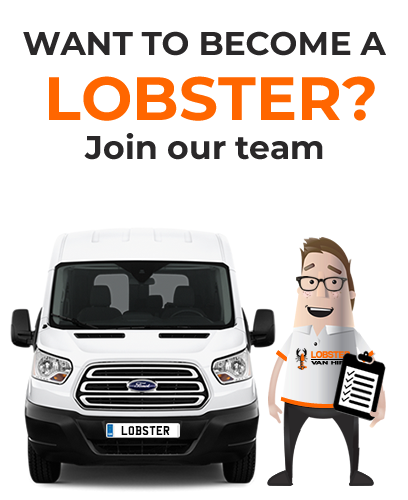 Write to: Lobster Van Hire Complaints Department, Unit 2, Belgrave Rd, Margate, Kent, CT9 1XG or call 01843 295336 / 01227 788220. Can vehicles be dropped off out of hours? Yes they can, but the hirers remain legally responsible for the vehicle until it has been checked in by our staff. Do you hire vehicles that we can take abroad? All our vans are eligible for European hire. We must have at least 5 working days notice for European hires. Is your day rate for 24 hours? Yes. Collection and drop off times are 8:30am and 16:30pm. Do you provide 24 hour vehicle collection? No. Paperwork has to be completed to cover insurance prior to hire. We can sometimes complete all the formalities before collection although the vehicle is only insured during the times signed for on the form. You would still be held liable for any damage to the vehicle whilst it stands awaiting collection. Please call us about this. Do I need to provide my driving licence? Yes, your licence must be provided before you hire the vehicle. Your driving licence, your National Insurance number, 2 x Proofs of Address (recent utility bills or bank statements confirming your current address). If you have the old style paper licence (no photocard) you must also bring another form of photographic I.D. For example your passport. Yes 21-75 years and must have been driving for at least 1 year. How long must I have been driving to be able to hire a vehicle? All hirers must have held a full licence for at least 1 year. Are the prices given inclusive of insurance? Yes, the price includes comprehensive Insurance Cover, Nationwide RAC Breakdown Cover and an allowance of 250 miles per day. We offer an optional excess waiver, which costs £8 per day of hire, extra. Can I hire a vehicle with endorsements on my driving licence? Details of endorsements must always be taken. Depending of the seriousness of the endorsement and the number of the endorsements, you may be able to hire a vehicle. Contact our office by phone or email with details to be sure. Remember if the full details are not given this may result in you not being insured. The initial price per vehicle covers one driver. Any additional drivers may be added onto the insurance at an extra price of £5.00 per driver per day of hire. No, unfortunately all vehicles must be returned to the collection point.